Central Bank Bills (CBBs) is an indirect monetary policy tool used by the Bank of PNG (or Central Bank) to implement monetary policy through its Open Market Operations. Monetary policy is the process by which the Bank of PNG controls the supply of money in the economy, often targeting a rate of interest with the aim of achieving and/or maintaining price stability and promoting economic growth. Features of CBBs are similar to Treasury Bills. It is a short-term discounted paper with fixed maturities of 28, 63, 91 and 182 days, redeemable at par on maturity. The Bank of PNG has the discretion to set the amount to be issued/sold together with the terms/maturities. 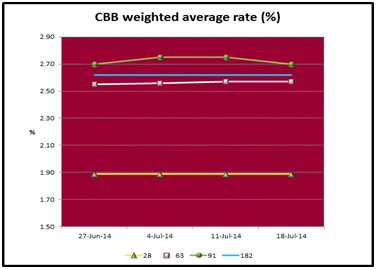 Interest rates or yields for CBBs purchased through an auction are determined by the investors when bidding. Investing in CBBs is restricted to only Commercial banks and other deposit-taking institutions. Eligible investors can invest in CBBs by purchasing through an auction which is conducted every Wednesday (weekly) from 9am – 11am, at the Bank of PNG. All CBB investors must obtain a Registered Bidder status with the Bank before investing. Investors outside of Port Moresby can also purchase or invest in CBBs. Rates or yields are determined by investors themselves through bidding.